Many people can say they race to work, but few can say they race for work. Patrick Lindsey is one of those few who add, race-car diver, to the resume. Lindsey's work abstract reads like a movie script fit for the silver screen. His motorsports career started on the back roads of Bakersfield, California where he first found interest in the sport through drag racing an old pickup truck. Alongside a decade long career in motorsports, Lindsey competed on the floor of the New York Stock Exchange. He helped grow a financial empire on Wall Street before switching gears to something even faster, aviation. He currently is President of Mira Vista Aviation, a jet management and charter company located in Los Angeles, California. When duty calls and time permits, Lindsey moonlights as a Gulfstream IV pilot. But still, Lindsey finds his adrenaline rush behind the seat of his No. 73 Porsche 911 GT3R. Splitting time between motorsports and any industry could have most heads spinning but not Lindsey. When the helmet goes on this laid back gentleman known for his big heart and cool demeanor becomes a competitive force to be reckoned with, and he has one goal in mind - a victory for Park Place Motorsports. After making his professional racing debut in 2007 in the elite World Challenge series, Lindsey has proven time and time again that his talent can place him on the podium any given day. His talent also lead him to the highest platform in North American endurance racing, the IMSA WeatherTech SportsCar Championship and in Europe with the World Endurance Championship. Lindsey's drive for continued advancement has seen him through drag strips to race school, club racing and eventually professional racing. Armed with fierce determination there is no guessing where it could take him next. 2017: Lindsey and Bergmeister completed their second season as teammates in the IMSA WeatherTech SprortsCar Championship series, once again competing in the Porsche 911 GT3 R. Lindsey and Bergmeister took home their first win together at Lime Rock Park and found the podium once again with a second-place finish at Road America. The duo strung four podium finishes together to end the year with a third place finish in the GT Daytona Class Championship. Park Place Motorsports was the highest finishing Porsche. 2018: Lindsey and Bergmeister took on a more substantial challenge by competing in not one, but two endurance series. In 2018, the duo enlisted the help of Egidio Perfetti to conquer the Super Season of FIA World Endurance Championship racing. Stateside Lindsey and Bergmeister competed in select IMSA WeatherTech SportsCar Championship races. 2018 was the pairings most successful outing to date. They took home a win at Fuji, a second-place finish at Shanghai and Laguna Seca and a third-place finish at Silverstone. 2016: Porsche Motorsports North America rewarded Park Place Motorsports and Lindsey’s long dedication to Porsche and efforts on track. The reward was Porsche Factory Driver and Le Mans winner Jörg Bergmeister of Germany. Lindsey’s determination and talent had Porsche looking at a very viable customer team. The pairing was sure to bring success and aid in Lindsey’s continued development in his No. 73 Porsche 911 GT3 R. The duo went on to podium three times in the 2016 IMSA WeatherTech SportsCar Championship season. 2015: Lindsey brought in the help of Spencer Pumpelly for the 2015 season of IMSA TUDOR SportsCar Championship and Tequila Patròn North American Endurance Championship. The two shared great success over the season with wins at Mazda Raceway Laguna Seca and Road Atlanta, Petit Le Mans. The team finished fifth in the overall Team Points Championship and sixth in the Endurance Championship. Lindsey’s success caught the attention of Porsche Motorsports North America. 2014: With the merging of the American Le Mans Series and Grand Am Rolex GT series NASCAR created a four class sports car power house in North America, IMSA TUDOR SportsCar Championship. Lindsey entered his No. 73 Porsche 911 GT America into the GT Daytona class amongst 29 other teams. They also competed in the new Tequlia Patròn North American Endurance Championship, a four race endurance championship. Lindsey and teammate Kevin Estre, now a factory driver for Porsche, finished fifth overall in the GTD points championship. 2013: Lindsey ran a full season in the Grand Am Rolex GT series with co-driver Patrick Long. Lindsey and Long scored multiple top five finishes and three, second place finishes during the season. It was a successful debut season for the newly formed Park Place Motorsports team, finishing fifth in the GT Points Championship. The team even traveled abroad for select starts in the ultra-competitive Porsche Carrera Cup Germany, scoring points with a 17th place finish in the first race at Hockenheim. 2012: Lindsey ran 10 races in the ultra-competitive Grand Am Rolex GT series with co driver Eric Foss. Always at the top of the timesheets in the Horton Autosport Porsche, the team ended its first Grand Am season with two top-ten finishes. Including his run in Grand Am, Lindsey made two starts in a return to the Hawk Performance Corvette in the Pirelli World Challenge GT series. 2011: Lindsey completed a full season in Pirelli World Challenge in the Grand Touring class. He ran the No. 12 Hawk Performance Corvette fielded by CRP. At the time the Corvette had just been introduced to the series. Lindsey and Crew Chief Nick Short would develop the car together successfully. The team took home multiple top-five finishes with a season best second-place finish. Lindsey also made his first start in the Grand Am Rolex GT series with the Traxxas Porsche GT3 fielded by Horton Autosport with co-driver Eric Foss. 2010: The Pirelli World Challenge series, then the World Challenge Grand Touring, was Lindsey's first step into professional racing. 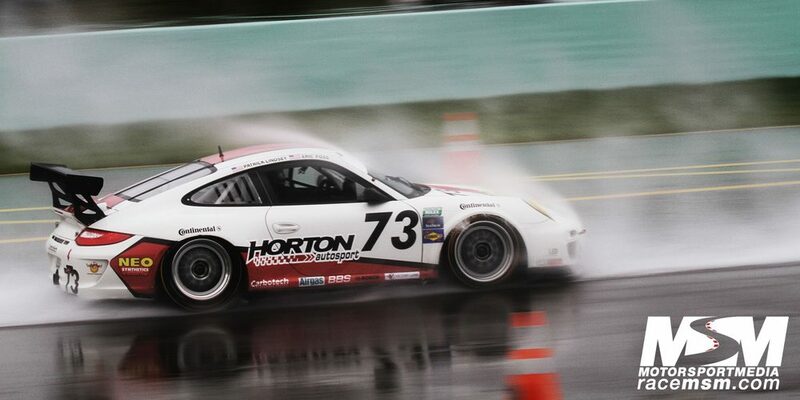 He competed in the Truspeed/Horton Autosport/ Sloan Securities Porsche GT3 Cup. In his fourth season Lindsey stood on the podium twice and earned seven top-five finishes. He along with Horton Autosport developed the Porsche GT3 to better work with the Toyo tires mandated by the World Challenge series. 2009: NASA’s American Iron series offered Lindsey seven grueling races that resulted in two wins and four podium finishes. He ran a Mustang in the American Iron National Championship race, pacing the field during qualifying and leading by a substantial margin before a electrical issue resulted in a seventh-place finish. He made four starts in the Speed World Challenge Touring Car series, resulting in two top-five finishes and one podium finish. Additionally, Lindsey received the “Autoweek move of the race” at the season finale. 2008: Lindsey ran a full season in the Speed World Challenge Touring Car series. This would mark his first full season in a professional racing series. He garnered one top-ten finish during the season. Highlights included a season best qualifying effort of second place and bringing home two, "Hole Shot," awards accompanied by one, "Hard Charger," award. Hard Charger is appointed to the competitor that moves up the most spots between qualifying and finishing a race. 2007: While racing his Mustang in NASA’s American Iron Series, where he would take home five wins out of eight races, Lindsey made his professional racing series debut. Lindsey first competed in the Speed World Challenge Touring Car series, driving the Horton Motorsport Mazda6. In his first event Lindsey qualified 18th and finished 12th. 2006 – In his second season in the NASA’s American Iron series, Lindsey scoring one win and two podium finishes. But perhaps more impressive were the multiple track records he set that year. Lindsey competed in both a Mustang, Pro7 MAZDA RX7 and his Audi S4. He won a Time Trial “A” and Performance Touring “A” National Championship in the Audi S4 and finished second in the American Iron Extreme Championship. The Audi S4 brought him luck again in the Superstreet/Eurotuner time attack, where he took home a top-ten finish overall. 2005 – Lindsey first obtained his competition license in 2005. He campaigned a 2001 Audi S4 for a full season in NASA’s Time Trial series, scoring many wins and track records. Despite changing classes after the season had already started, the result was a third-place finish in the championship. He drove his Audi S4 in the Superstreet/Eurotuner time attack, finishing 11th overall and fourth in the unlimited AWD class. He was the highest placing Audi, even over the factory supported team. 2003 – Developed a Penske damper package for the Audi (B5) S4 platform; later partnering with Startup Racing to bring the kit to market in a street and track form. He also developed various other suspension pieces for the same platform. Participated in the 2003 Open Track Challenge. 1998-2003 – In 1998, three months after receiving his driver's license, Lindsey participated in Skip Barber’s racing school at Mazda Raceway Laguna Seca and was immediately bitten by the racing bug. After Skip Barber he ran various cars in NASA’s HPDE program, developing car control skills and racecraft that would build a foundation for a racing career. He took his love of racing to college where he formed the Pepperdine Car Club in 2001. Lindsey coached members in the classroom and on the track.